perfect natural backdrop of harsh but at the same time incredible beauty. Pantelleria is an island of volcanic origin, sometimes called the “belly-button of the Med”, just 70 miles from the Italian coast and 40 miles from Africa. The island boasts no beaches of fine white sand, but fairy-tale scenarios created by black rocks falling sheer into a crystal-clear sea and vast stretches of Mediterranean brush growth. So, nature which is harsh and beautiful, offers inebriating scents and dream-like scenery. 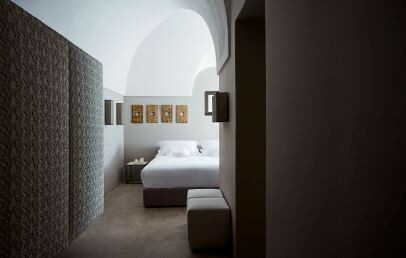 In the locality of Scauri is set Hotel Sikelia, a small gem of comfort and style, which will make your stay on Pantelleria a unique, unforgettable experience. There are many places of cultural and nature interest in the area, such as the Favara Grande (great jets of water vapor springing from the ground, of volcanic origin - 650 m), the Sauna of Benikula (a cave with natural vapor jets - 4 km), the Lake of Venus (a lake born from an ancient crater, with thermal springs and health-giving mud - 9.5 km), the Acropolis (an archaeological site with remains dating back to Punic and Roman times - 13 km) and the Byzantine Tombs (4 km). It is a small luxury hotel which appears to guests in the form of a Mediterranean casbah, with dominance of white and simple lines and where the architecture unites with nature in a balance which is truly amazing. The Hotel Sikelia was created by uniting a series of ancient dammusi – typical local structures with the addition of some modern architectural elements. In the common areas and rooms guests will find a soft, welcoming ambience, created by soft colorings, design furnishings and precious soft furnishings. There are large wicker armchairs and small works of art marking these rooms in which comfort and style blend harmoniously. Your hostess, Mrs Giulia Pazienza Gelmetti, will be there to welcome you to this small corner of paradise, making you feel truly at home. To complete the Sikelia experience, guests will find an excellent restaurant and a fine pool of irregular shape, set in a stone basin and surrounded by an African garden. In guaranteeing guests’ peace and quiet, the structure does not accept small guests under 12. 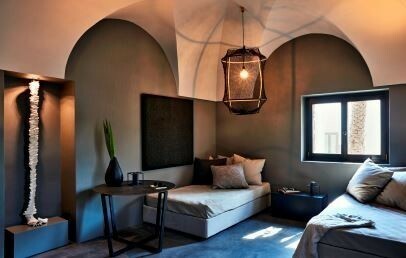 Sikelia’s 20 suites are set in ancient dammusi: the typical island structures, built in local black stone and with round white domes. The thick walls and barrel-vaulted ceilings ensure that all areas are cool and silent. In homage to their origin, the rooms are all different one from the other and are furnished with design furnishings, single local artisan antiques and fine works of art. Special care has been dedicated to the choice of beds – comfortable and provided with high-quality bed linen – and large sofas. 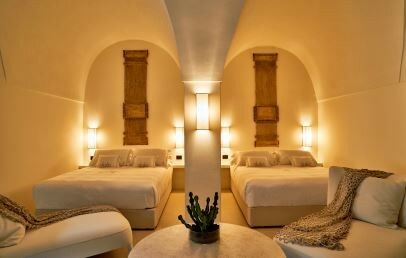 All rooms have complimentary Wi-Fi connection, AC, SAT TV, iPod station, coffee maker and Hermès courtesy toiletries. Cleaning services are provided twice a day. The Themà Restaurant & Lounge is a stylish gourmet restaurant offering simple dishes based on the tastes and flavours of the Island (vegetables, cheeses, capers and fresh fish) interpreted according to the skills of our Chef, and with an intriguing Arab/African touch. The Winery “Coste Ghirlanda” is partner to the hotel and provides the restaurant with excellent DOC wines, such the not-to-be-missed Zibibbo. On request, guests choosing the half-board formula, can choose to dine at the restaurant “L’Officina” of the Coste Ghirlanda Winery. Please note that all hotel guests have priority in restaurant bookings. For breakfast (08:00–10:30) each table is set with an individual buffet, with house specialities, sweet and salted delicacies. Ferragosto Gala Dinner with live music (August 15th): supplement of € 120 per person, drinks not included with booking in BB, € 65 per person, drinks not included with booking in Experience formula. To book and pay on-site. Your stay can be booked with the B&B formula or half board (formula Experience). Guests choosing half board can, on request, replace the evening meal with lunch, or à-la-carte. Services included in the cost of your stay include: transfers to and from the Pantelleria Airport, welcome drink, fresh and dried fruit in the room on arrival, fridge-bar with non-alcoholic drinks, Wi-Fi in all areas, tour and wine-tasting at Coste Ghirlanda, one excursion, hand massage. The Executive Suites are between 40 and 45 sq.m. and each comprise: bedroom, lounge and bathroom with waterfall shower. Some have a sea view while others have quaint and petite private open spaces. 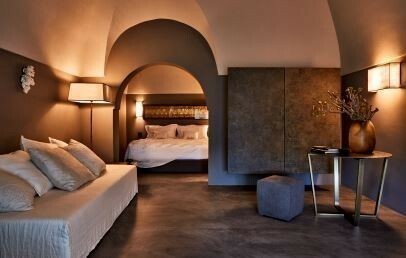 The suites, built within an ancient dammusi structure, are all different in conformation, but share the same stylish design and meticulous attention to detail. Because of the peculiar nature of the hotel, and the need to guarantee our guests the utmost tranquility, Sikelia is not suitable for children. 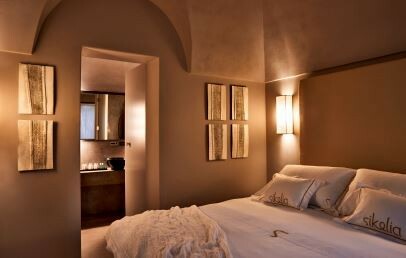 Our Master Suites are between 45 and 50 sq.m. and each comprise: bedroom, lounge, bathroom with shower, a private terrace or outdoor dining area. The 5 Iconic Suites are all different in conformation, but share the same stylish design and meticulous attention to detail. Room del Gelso is 45 sq.m. and comprises a bedroom, lounge, bathroom with shower, private terrace with views of the sorrounding countryside and a large typical ducchena. Room del Vento is 45 sq.m. and comprises: bedroom, lounge, bathroom with shower, private sea view terrace with a typical ducchena. Room delle Zagare is 46 sq.m. and comprises a bedroom, lounge, bathroom with shower, private sea view terrace with an outdoor dining area, second terrace with a typical ducchena. Room dell'Unica Volta is 40 sq.m. and comprises a bedroom, lounge, bathroom with shower, private terrace with sea views and outdoor dining area. 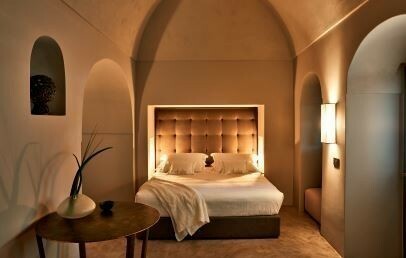 Room del Portico is 47 sq.m. and comprises: bedroom, lounge, bathroom with shower, private sea view terrace with a very large ducchena. La Stanza sui Tetti is 48 sq.m. and comprises: bedroom, lounge, bathroom with shower, private sea view terrace with an outdoor dining area, private access to Sikelia's dammusi rooftops with a 360° view. Experience the true atmosphere of traditional Dammusi. 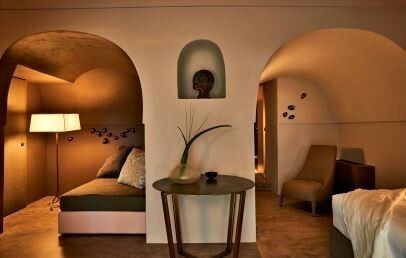 Finely furnished niches and alcoves with elegant details will transport you through an archaic experience. Our Suites Pantesche are 40 sq.m. and comprise: bedroom, lounge and bathroom with waterfall shower.